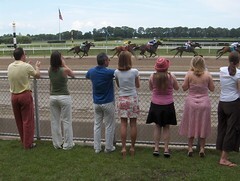 Belmont Park, Elmont, Long Island, July 8, 2006 - As I alluded to a few posts earlier, our pony-playing at Belmont was unsuccessful. Big gamblers that we are, we put up to five whole dollars on each race, and by the time we had to leave we were down ten dollars. Plus $2 for parking, $2 each for admission, and a whole lot for beer and food. Still, the day as a whole was successful. We were there for a friend's birthday party and met a whole lot of nice people - none of us were experts by any means (and that amused the stereotypical - but nice - cigar-chomping open-shirted middle-aged track regular sitting near us), but who needs to be an expert? Put $1 on a horse and all of a sudden you care. Really, it's great fun. Plus it was a beautiful day to be outside drinking beer and eating curried goat.